Indigenous reconciliation is often a fraught subject with phrases like ‘move on’ or ‘we weren’t responsible’ sometimes thoughtlessly bandied about. 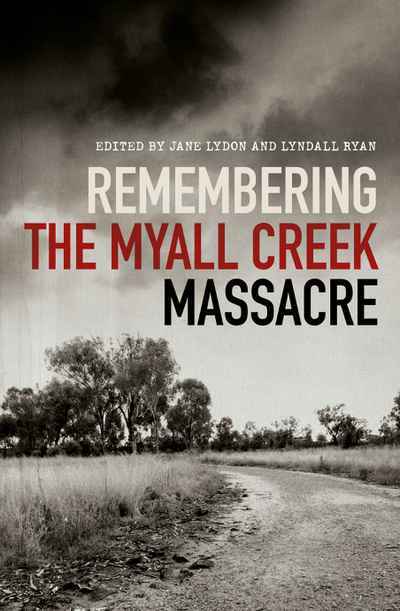 Remembering the Myall Creek Massacre edited by Jane Lydon (Wesfarmers Chair of Australian History at the University of Western Australia) and Lyndall Ryan (Conjoint Professor History in the Centre of the History of Violence at the University of Newcastle) turns a reader’s mind to this topic and to contemplation of the impact of Colonialism on Australia’s Indigenous population. The book is an interesting and thought provoking compilation of essays centred on the massacre of unarmed and peaceful Wirrayaraay people. On 10 June 1838, a group of 11 armed settlers and convicts, thought to have been led by John Fleming, rode onto the traditional Country of Wirrayaraay people and murdered approximately 30 people: mostly women, children and elderly men. The Wirrayarray were bound by the hands and neck with leather rope and walked away from the station and killed: shot, decapitated and hacked to death with cutlasses. To cover their crimes, the perpetrators returned the following day and burnt the victims’ bodies. Apart from the brutality of the act, the Myall Creek Massacre is memorable because white perpetrators were brought to trial and white men testified regarding acts of brutality committed against the Wirrayarray people. Eleven of the twelve culprits were tried; seven were hanged, although the ringleader John Fleming escaped trial and conviction. As colonialists pushed into Indigenous land, frontier violence became common. Many witnesses to massacres similar to that at Myall Creek were Indigenous and therefore precluded from giving evidence. What distinguished the Myall Creek court case from previous trials and trials that followed were the witnesses: white men who were brave enough to testify. William Hobbs, a white station manager, not only reported the Myall Creek Massacre to authorities but also testified against fellow white men. The case caused a deep divide in the colony: some people, angered that white men were on trial for aboriginal massacres, raised funds for the accused men’s defence while others such as Eliza Hamilton Dunlop, author of the poem The Aboriginal Mother, highlighted the plight of the Indigenous population. After the Myall Creek trial, no further white men were convicted of murdering aboriginal people. Mark Tedeschi, in the Afterword, likens to two Myall Creek trials to modern-day war crimes trials and believes the ‘hangings of seven of the perpetrators of the massacre merely served to drive future murderous acts underground, so that more surreptitious means, such as poisonings, were used instead of brutal, bloody slayings by sword or bullet or herding over cliffs or into swamps. My knowledge of atrocities committed against Indigenous people is limited. Indigenous history, throughout my school years, was not part of the history curriculum and I suspect many adult readers would have little knowledge of the Myall Creek massacre and similar atrocities suffered by the Indigenous population. Remembering the Myall Creek Massacre although academic in style is easy to read and enlightening. Occasionally I found some of the content in the essays repetitive, however, overall I would highly recommend the book. Recognition is the first step towards understanding and reconciliation. A must read.